Sign Up for Email or Text Message Alerts! 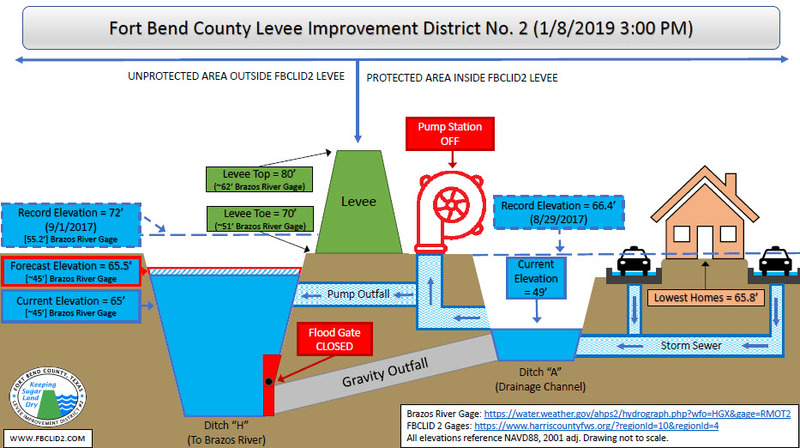 In June 2018, Fort Bend County Levee Improvement District No. 2 (FBCLID2) started construction on the Ditches B, C, and E Rehabilitation Project. These drainage channels remove rainfall runoff from a large portion of First Colony. The goal of the project is to rehabilitate the ditch bottoms to prevent further erosion and to improve slope stability within the ditches. When complete, the project will improve the efficiency of drainage inside the levee. FBCLID2 has also partnered with the City of Sugar Land to replace storm sewer outfalls that are adjacent to the project. The City owns and maintains the storm sewer that collects rainfall runoff from streets and delivers it to the FBCLID2 ditches through these outfalls. The project is currently scheduled for completion during Summer 2019. Construction in Ditch C is currently wrapping up and work in Ditch B will start in early February. The construction project requires heavy equipment (pictured below) to be operated in close proximity to homes. 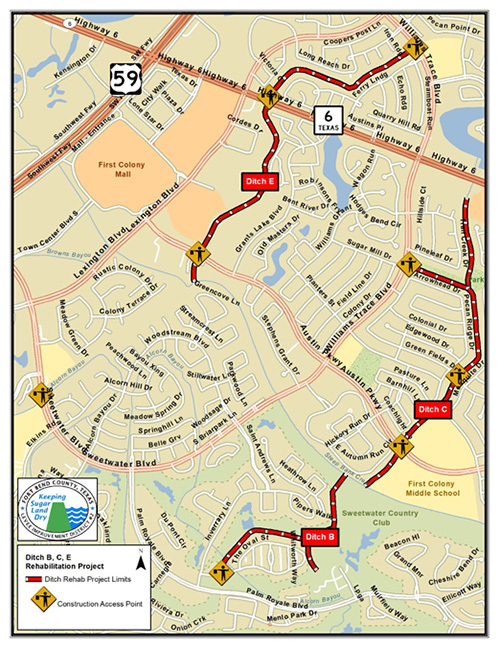 The contractor will enter construction sites from the locations shown on the map, including Austin Parkway, Highway 6, Sweetwater Blvd. and Williams Trace. Please be aware of construction activity when traveling through these impacted areas. For questions or comments about the project email the FBCLID2 General Manger at gm1@fbclid2.com. The below graphic describes the current status of Emergency Operations for Fort Bend County Levee Improvement District No. 2 (FBCLID 2). The Brazos River will crest over the next 1-2 days near FBCLID 2, located in Sugar Land, Texas. The water elevation in Ditch H created by the Brazos River will remain more than 4 feet below the bottom of the FBCLID 2 levee. The floodgates that protect FBCLID 2 are closed. If additional rain falls inside the levee while the flood gates are closed, the internal drainage channels have been pumped down to maximize storage capacity. The William “Bill” Little and Michael “Mike” Thelen Pump Stations are both fully operational and on standby in case it rains. It was just over a year ago that Hurricane Harvey devastated Southeast Texas and recovery has been ongoing ever since. FBCLID 2 has been actively working on a variety of projects to improve flood control, drainage, and communications throughout the District. FBCLID2 will host a public meeting on Wednesday, November 7, 2018 to discuss the District’s Harvey response with FBCLID 2 residents. The meeting will be co-hosted with the City of Sugar Land, and updates on City drainage projects will also be featured during this meeting. 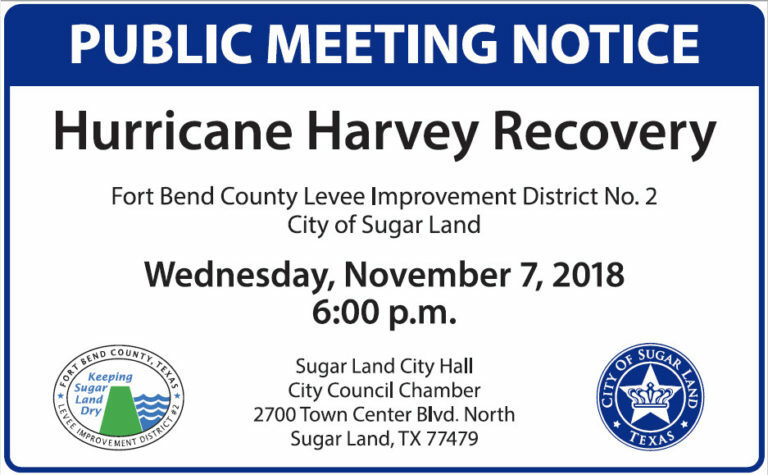 The meeting begins at 6:00 pm and will be held at Sugar Land City Hall in the City Council Chambers (2700 Town Center Blvd. North, Sugar Land, TX). The following is brief project summary outlining major projects included in the FBCLID 2 Hurricane Harvey recovery effort. Additional details will be presented at the upcoming public meeting or may be found online at www.fbclid2.com. Rehabilitation of Ditches B, C, and E: Construction has started and will be complete in Summer 2019. New Pump Station (Ditch A) – Preliminary design is complete and detailed design has started. The bid process for construction of the new pump station will begin in early 2019. Lower Internal Flood Elevation – Preliminary design on the new pump station will provide an additional 6+ inches of flood protection for all residents. 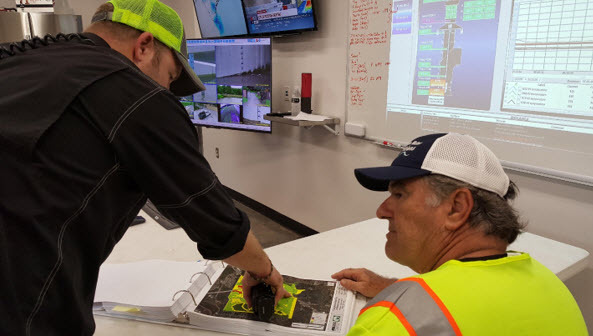 Flood Monitoring Project – FBCLID 2 has partnered with the City of Sugar Land and Harris County to add new flood monitoring stations inside the District. Construction will be complete in the Fall of 2018. High-Water Vehicle – the District will procure a high-water vehicle during the Fall of 2018. FBCLID 2 is thankful for all the support received from the community during and after Hurricane Harvey. Harvey reminded us that not all heroes wear capes, some wear rubber boots or just share a hot meal. The District operators worked around the clock for weeks to address the inundation of water due to Hurricane Harvey. During that time generous neighborhood residents lent a hand by donating their time, food, and even washing machines to assist District workers. Many neighborhood children also wrote kind thank-you notes to acknowledge the District’s hard-work and vigilance during the storm. 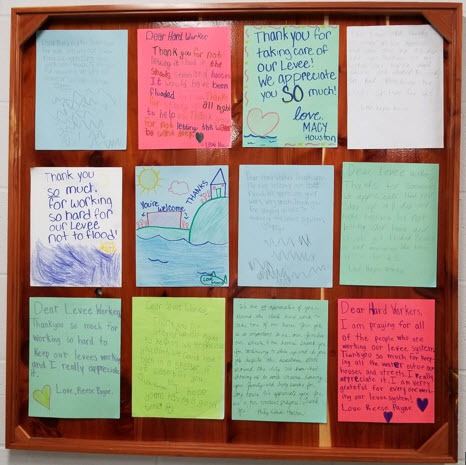 These letters have been posted on the wall in the Pump Station Operations Room as a constant reminder about the importance of the FBCLID 2 flood-control mission. 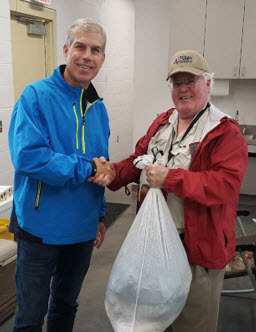 FBCLID 2 residents return clean laundry to Operators (pictured: Tim Stubenrouch – Market President, Pioneer Bank and André McDonald – President, FBCLID 2 Board of Directors). The Board generally meets on the third Wednesday at 8:30 AM. Please check agenda for meeting location. For persons with questions or needing help regarding website accessibility, or to request the provided information in alternative formats, please call (713) 860-6430.